Harrogate Large Extending Table 6 Chairs is rated 5.0 out of 5 by 2. 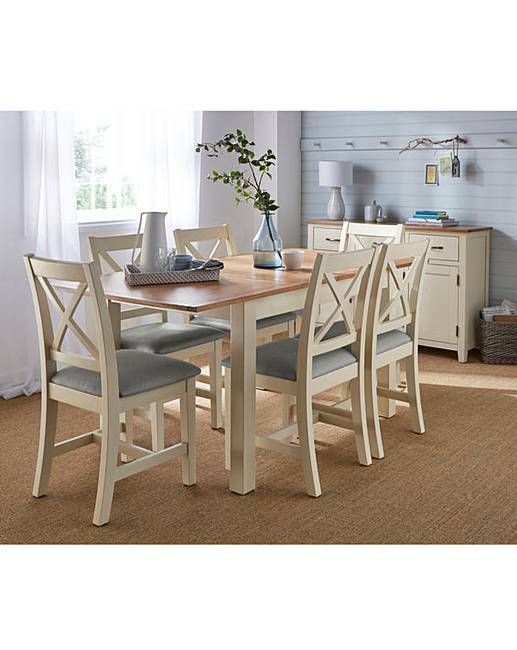 A beautifully finished country-inspired wooden dining range, that is a perfect accompaniment to any dining room. 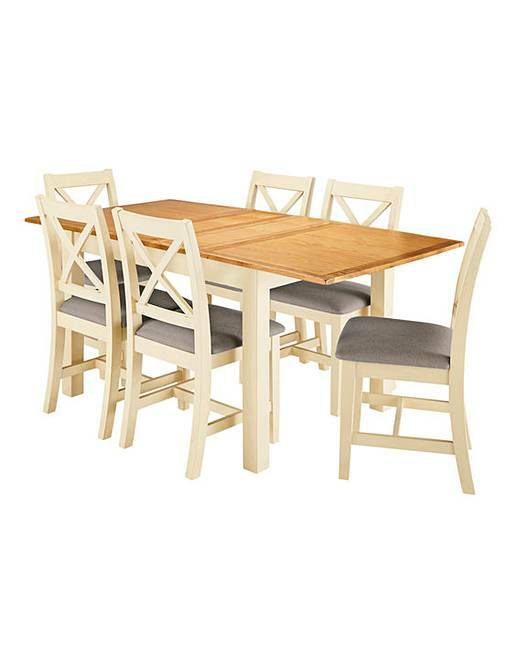 Save when you buy the Harrogate Two-Tone Oak and Oak Veneer 7-piece dining set. This dining set features the Harrogate large extending Dining Table, painted in a soft cream colour with a contrasting oak and oak veneer top. With hidden extention leaf, table can extend from L.120 to L.170cm. Complemented by 6 Harrogate two-tone dining chairs, painted in a soft cream colour with a cushioned seat pad upholstered in a light grey linen effect fabric. Table requires minimal assembly. Chairs are fully assembled. Chair maximum user weight of 17st/110kg. Table: H.75 x L.120-170 x D.80cm. Chairs: H.91 x W.46 x D.50cm. Seat height from floor 47cm. Rated 5 out of 5 by Gdarren5 from Superb quality looks fantastic We bought the 6 chair extending table and cannot believe the quality of the item. The photos barely do the table justice. We have been looking everywhere for a kitchen table and are so pleased we opted for this item. The chairs are incredibly comfortable and come fully assembled. The table top is lovely quality and has a slightly darker finish than the pictures make you think. It is great value and a very sturdy piece of high quality furniture. It looks modern and stylish. Everyone who has seen it absolutely loves it. It is a bit more expensive but worth every penny. Rated 5 out of 5 by Jax P from family dining table Table arrived flat packed, chairs already built, however the table was very easy to assemble, once built looks better than it did in the catalouge. Chairs are wider than normal, so more comfortable and the table is large enough for everyone to eat and have room, with plenty of space in the middle for extra dishes. Perfect for family gatherings. Glad I picked and bought this table and chairs.